The paperback version of Newton’s Ark should be available via Amazon in Europe from tomorrow for £5.99 or €6.99. US pricing for the paperback is $7.99. If you’re really worried about price though, the Kindle edition is a bargain at $2.99 (or the equivalent in pounds or euros). Interestingly, I make a bigger royalty on a $2.99 kindle edition than I do on a $7.99 paperback. That makes it hard to see how traditional publishers can justify asking almost as much for the Kindle version (and sometimes more!) than for the hard copy. e-books should be considerably cheaper, not only because they are much cheaper to produce and distribute, but also because they are more restrictive (you can only lend them once ever, if at all, and you can’t resell them) which ought to mean more sales. The disruption of the publishing market has really only just begun. 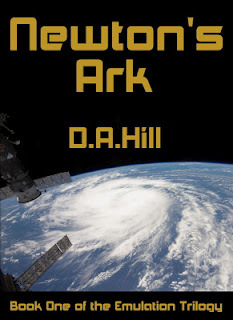 I recently independently published my first novel, Newton’s Ark, as an e-book in Kindle format via Kindle Direct Publishing Program I thought it would be worth making some observations for the benefit of other inspiring authors who might be considering this path. The big change that independent publishing makes is that it removes the traditional publisher as gatekeeper. There’s plenty of stories out there of books that were rejected by multiple publishers only to go on to critical or commercial success or both. What independent publishing does do though is push back on the author an awful lot of responsibility for the process of producing the book; stuff like editing and proof reading and formatting and design. You can do it yourself but it is not for the faint of heart. You need a combination of skills to get it right. Traditional publishing skills like attention to detail, editing and graphic design, mixed with the technical skills necessary to translate a manuscript in Microsoft Word into a properly formatted Kindle book within the constraints of the Kindle format (e.g. the fact that is has no such concept as ‘keep with next’) and the quirks of the Kindle publishing platform. The good news is that there are plenty of people out there who will take care of this stuff for a modest fee. I didn’t try any of them – I was determined to do this myself – but if you don’t like banging your head against a wall as much as I do, perhaps it is worth trying. It is way too early to tell whether independently publishing via Amazon will be a commercial success. That seems to me to be dependent on a mix of the quality of the book, the marketing effort and sheer luck. I can control the first factor, am working on the second one but it’s not my strength, and can only cross my fingers in terms of the third factor. I will also be releasing a paperback version soon, also independently published, this time via a company called CreateSpace (which happens to be an Amazon subsidiary). I’ll report on that process once it is complete. This post brought to you by D.A.Hill, author of Newton’s Ark.